It was early June of ’08 and the world was ready for some major soccer. International soccer. The European Championship was ready to roll. As the field in soccer gear sales is as competitive as the game on the field itself, we merchandisers thought it’d be quite clever indeed if we got a kick-start (notice the clever word-play there) on the competition and the subsequent demand for player jerseys by creating some customized jerseys of some of the top players to take part in the very prestigious tournament. It was sad that we didn’t get to make a slew of Beckham jerseys at that time, but there were other notable players to fill that blonde void. Cesc Fabregas and Cristiano Ronaldo are a couple that come to mind. Yet, it’s not randomly that I think of these two young aces of the English Premier League and the Iberian Peninsula. No, it is because of the headaches those two mercurial lads caused us during that summer of great soccer spectacle. 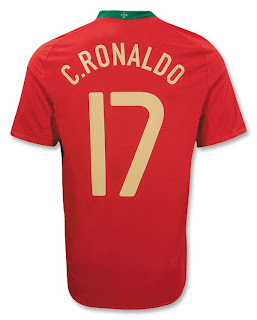 For as long as those two bright stars of the soccer galaxy have played the game, they’d worn the number 17 and 18 respectively. Yet, for some strange reason, be it prestige or be it boredom, they opted to throw their fans a curveball (pardon the baseball metaphor) and switch their numbers—and their names for that matter. Spain’s Cesc Fabregas had gone by CESC with the #18 when he played for La Furia Roja, but was apparently promoted to the #10 and this new post seemingly required use of his surname: FABREGAS. Then, the most popular player in all the land, decided the ‘C’ before his name was as useless as the ‘1’ in front of the ‘7’ he’d worn heretofore, and ditched them both like an old pair of cleats. 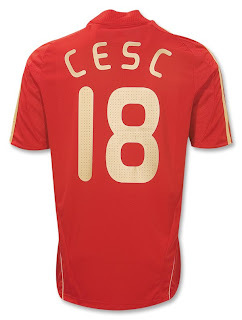 This was the merchandising equivalent of an own-goal, leaving us with dozens of #18 CESC and C. RONALDO 17 shirts that just brought us snarky comments from browsers about how out of touch we were. Not even reducing the price helped us save face. But why do I tell you this? Why, on such a jolly time, when the Holidays are so near and sales have been so good, do we talk of mercurial number changing? Well, it’s Julie’s fault. 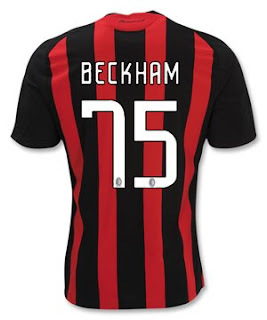 You see, Julie bought an AC Milan Beckham 75 jersey and it turns out Spice Boy threw us all for a loop when he decided to not wear 75 (the number of his birth year) after all, but instead went with 32! Why 32? Why not 33 his age? No matter. Julie is angry and rightfully so. As we are we. Because we pride ourselves with great service, we will do something amazing to satisfy Julie. Yet, we are now stuck with BECKHAM 75 jerseys that look utterly ridiculous and as useless as a irrelevant as an England Euro 2008 T-Shirt (yeah, we were stuck with those as well) I feel like a little sad-faced wingding would be appropriate here, but there’s no sadness in soccer – or soccer merchandising for that mater. We will overcome this embarrassing incident with our heads held high. For Julie and thousands more soccer fans like her, most of which will get the shirt they wanted, hopefully for at least a few years, until his/her player changes numbers/names. A suggestion: stick your own name on the back of it, unless YOU plan on a name-change.